Record Store Day isn’t just about records, it’s also about stores. As Cate Le Bon recently put it: “They’re a hub of what’s going on and when they’re curated well and when they’re taste-making record stores it can make all the difference.” Dallas’ Good Records is one such store, and they commemorate Record Store Day each year with a full day’s worth of live music. 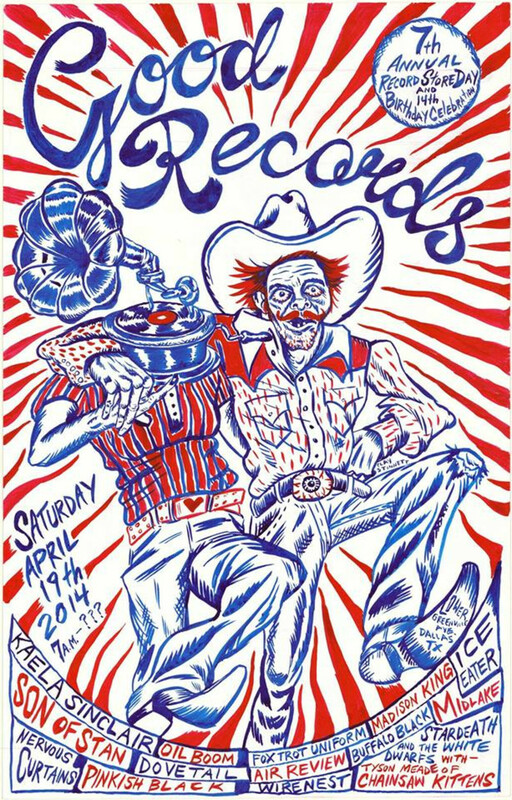 For this year’s Record Store Day Good Records are hosting a bash with a long list of bands performing live – Buffalo Black, Air Review, Dovetail, Ice Eater, Madison King, Nervous Curtains, Oil Boom, Pinkish Black, Kaela Sinclair, Wire Nest and Son of Stan among them. Additionally they’ll be DJs spinning tunes in the parking lot from 10am-8pm, including Ken Bethea (Old 97’s) and Taz Bentley (Reverend Horton Heat/Burden Brothers/Izzy Stradlin/Hell Texas). Two performances stand out. First, the headlining attraction: Stardeath and White Dwarfs with Chainsaw Kittens frontman Tyson Meade will cover David Bowie’s The Rise and Fall of Ziggy Stardust and the Spiders from Mars at 11 pm. Yes…the entire album, top to bottom. This will be their second performance of this classic LP, following last New Year’s Eve’s performance in Oklahoma City. Tyson Meade killed it tonight, as Bowie! @STARDEATHontour you guys knocked it outta the park other night at the Good Records!! Also be sure to catch Midlake’s special unplugged at 5 pm, a warm up gig for their upcoming acoustic tour with Neil Finn. “Midlake have been long time supporters of Good Records. (They even wore a Good Records shirt on The Late Late Show with Craig Ferguson in 2005),” Good Records notes. Scroll down for set times, bios and links to stream all these bands music is below. All bios via Good Records’ press release. Also visit The Future Heart Record Store Day 2014 events guide, for other happenings a-happening in shops across the country on April 19th, and this guide to the most anticipated new releases out that day. “Though this marks the debut for Denton newcomer Kaela Sinclair, it’s got all the ingredients to help the 23-year-old become the Little D’s next big thing.” – Central Track In collaboration with acclaimed producer and drummer, McKenzie Smith (Midlake, Regina Spektor, St. Vincent), the 23 year old from Denton, TX has showcased her compositional skill, lush vocals, and intelligent lyrics. Sun & Mirror was named Best Local Album of 2013 by the Ft. Worth Star-Telegram and DFW.com. Sinclair was named one of the Dallas Observer’s 12 North Texas Artists to Watch in 2014. Central Track named “Original Sin” as one of their Top 50 Songs of 2013, and Coral Castles was #3 on the Top 40 Songs of 2013 list by blogger Ghost of Blind Lemon. If you haven’t seen her yet this is your chance to rectify that on Record Store Day for FREE no less. “Before too much longer, it’s going to be tough to write about Oil Boom without devolving into a string of superlatives, glued together with exclamation points. The trio, spread between Dallas and Fort Worth, is sharp as ever on this new 7-inch single (following last year’s superb LP Gold Yeller).” – PRESTON JONES DFW.com At the just passed SXSW 2014, NPR selected Oil Boom as one of “10 Songs Public Radio Can’t Stop Playing.” Do not miss this trio unless you don’t want your face rocked off. Band members always seemed to leave, so it only seemed right that Kenny Uptain and Kelly Test turned their band into a duo. After being thrown out of country bands, and losing their best bud of a bass player to the working world, they decided to go the route of the 2 piece rock and roll band. After recording their first full length album, “Huj! Huj! Hajrah!” in the living room of Test, and playing close to 200 shows their first year, the two felt the need to expand. In September of 2012 the duo became a 4 piece with the addition of Dallas musicians Robbie Saunders and Zack Busby. Adding many layers and depth to the band’s already full sound, Robbie and Zack play the parts you might find yourself humming instinctively. In January of 2013 the group has seemingly filled out their lineup with the addition of Fort Worth area songstress, Katie Robertson. Keep an eye and an ear out for this newly structured, always evolving Texas band. They recently released a 7″ single “Ey.Miner” which has a nearly 9 minute epic that is worth the price of admission alone. With that being said once we heard her sophomore effort “Onward & Upward” we had to have her a part of Record Store Day. Look out Kacey Musgraves of the world! 5 dudes from Texas they proclaim. Elements of Post-Punk, Industrial, New Wave, Dance Rock and Shoegaze combined while maintaining a strict Pop sensibility. Get ready to dance to their smooth atmospheres and jarring confusion. With their amplified synth-rock and creeped-out, cryptic vocal hooks, Nervous Curtains’ latest record takes you into a world of “Fake Infinity” where everything you think you know is wrong. The canvas here is filled out by black space organ and pulverized synthesizers. The grand piano that dominated the Dallas, TX-based trio’s 2010 debut, “Out of Sync with Time,” is used sparingly, lending these songs an aura of impenetrability. Sean Kirkpatrick, formerly of The Paper Chase, has written a record that wakes you up and shakes you out of the usual stupor. Sean and the rest of the band are great customers of the store and we are honored that they volunteered to be a part of the hoopla that is Record Store Day. Midlake have been long time supporters of Good Records. (They even wore a Good Records shirt on The Late Late Show with Craig Ferguson in 2005.) Last November they released the wonderful “Antiphon.” Schedules didn’t align for the band to do an instore to celebrate its release but the moon is aligned with Jupiter now and our favorite sons from Denton will use Record Store Day as a way to warm up for their upcoming ACOUSTIC tour with Neil Finn. This will be a great opportunity for us local folk to get a taste. Jordan Richardson is a musician/creator/cuddler. He plays drums for Ben Harper. He also goes by Son of Stan. His other musical endeavors include EPIC RUINS and Future People. Additionally, he produces music and DJs around the globe. Preferably at malls, when possible. If we are lucky we may get a deejay set in addition to a Son of Stan performance. We will simulate a mall in the parking lot. In all seriousness, his album “Divorce Pop” is quirky and catchy as hell. He partook in Cassette Store Day now we are glad he has made the jump to be a part of our Record Store Daythrowdown. Jordan will fit right in. Air Review gracefully combines folk influences with synthesizers, beats and noisy guitars. They are soft and subtle at times, yet unmistakably anthemic, complete with magnificent choruses. We are excited to have Air Review be a part of the festivities. Dovetail is a band fronted by singer/songwriter Philip Creamer. Joined by brother and co-writer Daniel Creamer, the band is a family of creative free-spirits in pursuit of the high and lofty. Dovetail gives much credence to musical predecessors, and lives in a magic place of sonic discovery. Dovetail won the John Lennon Song Contest in 2012 with the original song Julie. If you are a fan of The Beach Boys, Big Star, or the Byrds you should definitely catch these guys on the astroturf. Jmil Kly aka Buffalo Black represents a new breed of Artistry out of Dallas, Texas. Buffalo Black is an identity that represents the vagabond/outlier/”man with no name” archetypes of Akira Kurosawa and Sergio Leone films. “Yojimbo”, “Fist Full of Dollars”, these films explore aspects of the archetype that present the anti-heroes as individuals who do and roam where they please, free the confines of conformity, acceptance and structure. The Various Experiences represented in the Album, wander through moments of Self Realization, Lust, Weakness, Fearlessness an Hope.. Both Primal and Sexual Interpretations are explored. All are pure concentrated emotion and expressionism that derives from the essence of Human Experience. We stumbled upon one of his visual accompaniments and were hooked with his “truthful” hip hop. “If there’s been an adventurous metal band that’s come through Dallas or Austin in recent times, there’s a good chance Fort Worth duo Pinkish Black has opened for them. Keyboardist and vocalist Daron Beck and drummer Jon Teague flip the idea of what metal can be by employing aggression and tense space without guitars, “riffs” in the traditional sense, or anything in the traditional metal sense, really. Pinkish Black resemble a Popol Vuh that suddenly became obsessed with denim and leather, or an enterprising Goblin that, after doing scores for Dario Argento, discovered that headbangers love horror movies.” – Pitchfork (who has actually given Daron and Jon 7 and 7.2 on their first two releases) We have been big fans of all of Daron’s projects especially his American Idol tryout. Make sure you pack earplugs and if you forget ask us at the counter for a pair. You will thanks us later. Every year Record Store day we like to have a left field act. We have flown in bands (Zomes), got college favorites to play (Glorium), recruited sales reps who have solo projects to come from San Francisco (Colossal Yes aka Utrillo Kushner of Comets on Fire) and pieced a backing band out of local musician friends, etc. We deem Record Store Day as a celebration of all mom+pop stores still kicking treads on the tires. We also use it to celebrate our birthday…we turn 14 this year. As a treat for ourselves and our constituency we have coerced longtime Good Records supporters Stardeath to recreate their most recent NYE show where they covered David Bowie’s classic “The Rise and Fall of Ziggy Stardust and the Spiders from Mars” top to bottom with Tyson Meade of Chainsaw Kittens fame joining in on vocals. We were bummed we didn’t get to see the NYE show but now we do and you do too. Wire Nest is a collaboration between Frank Cervantez and John Nuckels who have been band members for over 10 years in the Texas live dub band, Sub Oslo. They recently brought in their debut release and we fell in love with it. The perfect blissed out closer to a 14 band marathon session.